SWAT teams swarmed a New Jersey high school Monday as locked-down students texted fearful parents after authorities said a classmate with a rifle in his home threatened a shooting. Dumont High School was placed on lockdown for more than four hours as police responded to the threat. Students were ordered to stay inside the school and in some cases, on the bleachers near the track. Heavy police presence at Dumont High School. Afterward, Dumont Police Chief Michael Connor said a 15-year-old sophomore -- who was unarmed at the time and hasn't been identified -- had been taken into custody after threatening on social media to shoot up the school. Connor added that a long gun was found at his home, but it was not clear if the weapon belonged to him. Students seated on the bleachers at Dumont High School during lockdown. 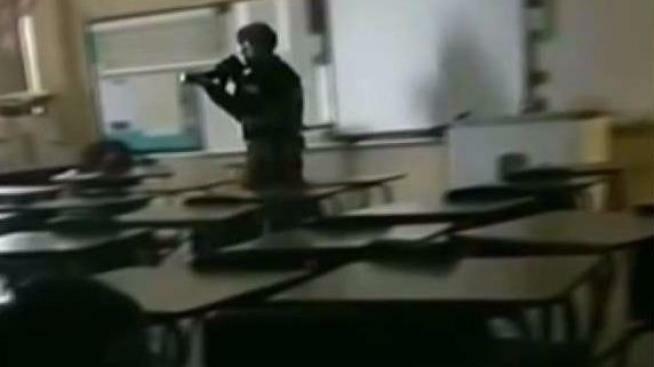 Video from inside the school showed students crouched inside classrooms. And text messages obtained by News 4 show a student and parent texting one another about the lockdown. "I hope it isn't anything serious," texts one parent. The student responds, "If it is...I love you." Heavy SWAT response at Dumont High School Monday. Chopper 4 footage from outside the school, meanwhile, shows tactical crews going into the school. A short time later, a student was seen being escorted outside in handcuffs and put in a police car. A student in handcuffs is led from the school after SWAT and police respond at Dumont High. Around the same time, parents crowded outside the school waiting for students to be sent home. Police said all 800 students were debriefed and dismissed around 3:30 p.m.
District officials say school is expected to be open on Tuesday. The scare comes after a tense week at schools in New Jersey following the high school massacre in Parkland, Florida, that left 17 people dead. Among the scares in the Garden State was a rumor a shooting threat that spread "like wildfire" through the Bayonne community on Friday. That threat actually originated in New Mexico, where a student was arrested for allegedly making a threat at a school south of Albuquerque. Other districts in New Jersey, meanwhile, have stepped up security; at least one district voted to place armed security at school entrances for the remainder of the year following the shooting in Florida.